IBFAN with the People’s Health Movement Watchers who take notes of the whole meeting. Bravo! From the left for PHM: Maninder Pal Singh, Gargeya Telakapalli, Alexexandre Gajardo, Anna Peiris, Sarai Keestra. IBFANers Patti, Fedora Bernard and Alessia Bigi. PHM again: Stuti Pant, Giulia Loffreda, and Damir Martinovi. I’ve been at the WHO Executive Board meeting since 24th January – joining IBFAN GIFA colleagues Alessia Bigi and Fedora Bernard and partner NGOs (members of the G2H2 Geneva Hub): People’s Health Movement, Third World Network, IOGT, Medicins sans Frontieres, Medicus Mundi, Wemos, Oxfam, Knowledge Ecology International and Drugs for Neglected Diseases. 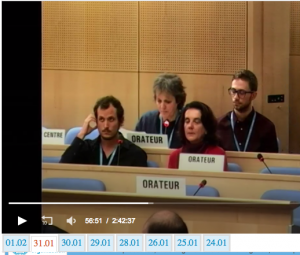 IBFAN and many of the NGOs are warning WHO of the risks of getting too close to corporations and the need for WHO to develop a sound Conflicts of Interest (COI) policy that will address WHO’s own institutional COI. As one of WHO’s longest-standing public interest partners IBFAN strongly supports the principle of publicly funded UHC and welcomes WHO’s acknowledgement that primary health care is its foundation. However, that so little attention is paid to the need for conflict of Interest safeguards is worrying. WHO’s keenness to involve the corporations and its fear of being seen as ‘risk averse’ now seems more evident than its concern about being seen as cavalier, even negligent. 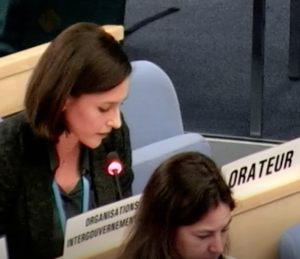 Of course WHO cannot police what happens at country level, however it does have an obligation to warn Member States of the risks of inappropriate commercial involvement in health care services. If it doesn’t the public might surely question its independence, integrity and trustworthiness. There are countless examples of patient being misled and health being harmed because of such involvement. To take just one – baby food company phone apps that advise mothers how to feed their babies. If WHO does not want to be seen as endorsing such things it needs to repeatedly warn of the risks of inappropriate sponsorship. Innovation that can genuinely advance health is to be welcomed – but corporations do not have a monopoly on innovative ideas. Unless their interventions are carefully screened and monitored by truly independent bodies, their risks to health and increased costs to services can sabotage public health goals. If corporations are involved in monitoring and reporting – as they might be in a Public Private Partnership – the benefits of interventions are likely to be promoted above the risks. Companies are soon trusted to help with health care planning, given access to personal data and everything else they need to expand their markets. Meanwhile the publicly funded health care systems that exist in many countries are under attack from those pushing privatised systems. 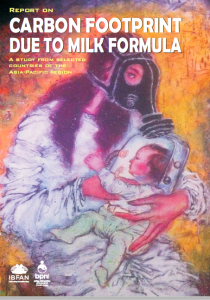 While we are calling for the reduction of avoidable environmental risks, global sales of breastmilk substitutes (BMS) increase rapidly every year, boosted by sophisticated marketing against which breastfeeding cannot compete. These products are, of course, necessary for babies who are not breastfed, but the fact is they need energy to manufacture, materials for packaging, fuel for transport distribution and water, fuel and cleaning agents for daily preparation and use and generate Green House Gases. More than 4000 litres of water are estimated to be needed along the production pathway to produce just 1 kg of formula powder. If breastfeeding was considered a public health intervention for climate change prevention and mitigation perhaps more would be done to end misleading marketing of baby food companies and to support women who want to breastfeed. 12. Governance. National and local governments (for example, of cities) have mechanisms in place that facilitate cross-sectoral cooperation and integrate health in all relevant policies and ensure that they fulfil their obligations to provide safe environments for their citizens. IBFAN has worked with WHO on NCDs since 2003 and knows that the threat to public health cannot be solved by national policies alone. It needs an international solution to tackle the power of multinational food corporations – who all share the same tactics as the tobacco industry. WHO’s courage to continue its work on baby food code, tackling conflicts of interest and integrating the Code and WHA Resolutions into Codex trading standards, is an important model to follow that continues to save many lives. Thank you. Sadly, WHO’s work on NCD’s has in many ways been derailed and is now becoming unsustainable. WHO’s “fresh working relationship” with the food and related industries seems to be promoting the Public Private Partnership model – without the resources to identify and manage the risks. Without such scrutiny WHO’s name is being misused and its health goals undermined. WHO should be working with governments, small farmers, social movements and others to prevent soil depletion, deforestation and land-grabbing. It must encourage the healthy, biodiverse and culturally appropriate food that is best for humans and the planet. Instead WHO seems transfixed with persuading food corporations to produce slightly less harmful – but still highly processed products and risky technological fixes. IBFAN has sat on the European Commission’s Diet Platform for over 10 years and has seen its risks and limitations. Sound ideas are displaced by voluntary, here today, gone tomorrow promises and effective regulatory action is delayed. Among the many factors that increase the risk of AMR are poor animal husbandry and crop management, pharmaceutical promotion and over the counter sales that encourage inappropriate use of anti-biotics. We note that only 64 countries have limited the use of critically important antimicrobials (human and animal) for growth promotion in animal food production. Strong health care systems, cross agency action, surveillance and regulation of all the industries involved is clearly essential. However, care must be taken to ensure that any public private collaborations do not muddy the waters, slow everything down and lead to weaker controls and action. There is evidence that a higher dependence on the private health sector and higher density of private health clinics is associated with increased AMR due to frequent overuse of antibiotics. Agenda item 7.3. Engagement with non-State actors (FENSA). IBFAN supports Medicus Mundi’s highlighting of the extent of private funding of NSAs. It is essential that genuine civil society participation in governing body meetings is not undermined. Tobacco is not the only risk! The lack of transparency caused by the term NSA could be helped with different coloured badges, distinguishing civil society NGOs from businesses. Good that an evaluation of FENSA will be carried out in 2019. Please can this be a thorough, public and transparent review involving conflict of interest experts and critical civil society organisations. Most urgently please correct the definition of what a Conflict of Interest is and develop a comprehensive policy that addresses WHO’s own institutional COI.